This article is about the America's Got Talent winner. For the U.S. Representative from New York, see Michael Grimm (politician). Michael Joseph Grimm (born December 30, 1978) is an American singer/songwriter and winner of the fifth season of America's Got Talent. Grimm was born in Colorado on the Fort Carson base, moved to Slidell, Louisiana, but later raised in Waveland, Mississippi. He currently resides in Henderson, Nevada. He was raised by his grandparents in Mississippi. Making good on a promise, America's Got Talent (AGT) winner Grimm proposed on September 16, 2010, to Lucie Zolcerova, his girlfriend of nearly three years, during a taping of The Ellen DeGeneres Show which was aired on September 17, 2010. Grimm, a Mississippi Southern Soul singer who won the $1 million AGT first prize in its 5th season, used some of his winnings to build his grandparents a new house. During the AGT finals, he revealed that his girlfriend, Lucie, was the inspiration for his performance of "When a Man Loves a Woman". "She's been there for me," Grimm told DeGeneres during the show, which aired the following day. "Once you find that good woman you hang on to her." While interviewing him, DeGeneres called Lucie down from the audience, and Grimm got on one knee to propose. Her answer was a swift "Yes". Grimm auditioned in Los Angeles for the fifth season of America's Got Talent aired on June 1, 2010. His audition received praise from all three judges, advancing him to Vegas Week. During Vegas week, his performance of "Try a Little Tenderness" was criticized by Piers Morgan for being way over 90 seconds and could have gotten him disqualified. He still advanced to the quarterfinals. His quarterfinal performance, "Tired of Being Alone," was once again praised, and advanced to the semifinals. Earlier in the show, Sharon Osbourne commented that her husband Ozzy Osbourne was rooting for Grimm. Grimm performed "You Can Leave Your Hat On" during semifinals while recovering from a dehydration related illness. Despite the illness, he managed to deliver a performance that was once again praised by the judges, and he advanced to the finals. After performing "Let's Stay Together" in the Top 10 without his guitar, he advanced to the Top 4. In the finale on September 14, 2010, he performed "When a Man Loves a Woman" pointing to his girlfriend, Lucie, in the audience. The following day, it was revealed that Grimm won the show, beating child singer Jackie Evancho. Grimm's winnings included one million dollars (before taxes and reduction for lump sum payment) and the opportunity to headline the AGT Tour Show, including one show at Caesar's Palace in Las Vegas on October 8, 2010. In September 2010, Grimm appeared on The Ellen DeGeneres Show and proposed to his girlfriend of nearly three years, Lucie Zolcerova. The AGT Tour Show stopped in 25 cities, beginning October 1 and ending November 7, 2010, where Grimm performed with other top ten contestants of the fifth season of AGT. On June 1, 2011, Grimm married his fiancée, Lucie Zolcerova, in a small private ceremony in Maui, Hawaii. The ceremony was held on the beach at the Makena Beach & Golf Resort in front of about 30 family members. Andres Delos Santos and Nate Martin from "Ten Feet" along with Kevin and Dawn Okimoto and Alex Pula entertained the party, backing the newlyweds as they serenaded each other with their favorite song, "Islands in The Stream." Bill Medley of The Righteous Brothers was in attendance. Grimm performed at Las Vegas, Nevada casinos for eleven years prior to his AGT success. On September 29, 2010, Michael signed a record deal with Epic Records. The album was released on May 17, 2011. Grimm performed at the 2010 Macy's Thanksgiving Day Parade. On December 3, 2010, Grimm and Smokey Robinson raised over $1 million during the 37th Annual Candlelight Concert. On March 24, 2011, Grimm returned to The Ellen DeGeneres Show to promote his upcoming self-titled album and perform his newly released single (March 22, 2011) "Fallin'" written and recorded by Alicia Keys in 2002. The album debuted at #13 on US Pop Music Charts on May 26, 2011, selling 23,000 copies. According to the Billboard Top 200, his album was #13 the week of June 4, 2011. Grimm performed on the Top Ten show of the sixth season of America's Got Talent on September 6, 2011. Also in the summer an autumn of 2011, Grimm opened for Stevie Nicks. ^ "Amazon.com: Michael Grimm: Songs, Albums, Pictures, Bios". Amazon.com. Retrieved 17 September 2014. ^ "Niet compatibele browser". Facebook. Retrieved 2010-09-16. ^ Catlin, Roger. "Four More Go to 'Talent' Semifinals - Roger Catlin | TV Eye". Blogs.courant.com. Archived from the original on 2012-07-08. Retrieved 2010-09-16. ^ Exton, Emily (2010-07-22). "'America's Got Talent': The suspense is killing us | EW.com". Popwatch.ew.com. Retrieved 2010-09-16. ^ "America's Got Talent - First Semi-Final Contestants Take the Stage! | CMR". Current-movie-reviews.com. 2010-08-24. Archived from the original on 2010-12-10. Retrieved 2010-09-16. ^ "'America's Got Talent': Prince Poppycock's 'Bohemian Rhapsody' steals the show - It Happened Last Night - Zap2it". Blog.zap2it.com. Archived from the original on 2010-12-23. Retrieved 2010-09-16. ^ "Male Singers Compete ~ America's Got Talent Vegas Week Day-1". YouTube. Retrieved 2010-09-16. ^ Fleeman, Mike. "America's Got Talent Winner Proposes to Girlfriend – on TV! - Engagements, America's Got Talent, The Ellen DeGeneres Show". People.com. Retrieved 2010-09-17. ^ "Michael Grimm proposes to girlfriend on 'Ellen' after winning 'America's Got Talent' - The Dish Rag - Zap2it". Blog.zap2it.com. Archived from the original on 2010-10-23. Retrieved 2010-09-17. ^ "Michael Grimm says he feels blessed to be a part of 'America's Got Talent,' hitting Caesars today - Entertainment / Neon - ReviewJournal.com". Lvrj.com. 2010-10-08. Retrieved 2010-11-14. ^ "Uncle Tom's Gabbin' - June 22, 2011 - Uncle Toms Gabbin - Midweek.com". Midweek.com. Archived from the original on 29 August 2011. Retrieved 17 September 2014. ^ "Wedding Photos: 'America's Got Talent' Winner Gets Married! - tooFab.com". Toofab.com. Retrieved 17 September 2014. ^ "'America's Got Talent's' Michael Grimm signs Epic record deal - From Inside the Box - Zap2it". Blog.zap2it.com. 2010-09-29. Archived from the original on 2010-12-29. Retrieved 2010-11-14. ^ "America's Got Talent's Michael Grimm Plans Album Release <Top Story ::Michael Grimm News". antiMusic.com. Retrieved 2010-11-14. ^ "Winner of NBC's America's Got Talent Michael Grimm Set to Release Album... - NEW YORK, Nov. 2, 2010 /PRNewswire/". New York: Prnewswire.com. 2010-11-02. Retrieved 2010-11-14. ^ "Concert Raises More Than $1 Million for Charity". Beanstalkbiz.blogspot.com. 2010-12-06. Retrieved 2011-03-14. ^ "Community news from Biloxi and Gulfport, MS - Sun Herald". Sunherald.com. Archived from the original on 22 March 2011. Retrieved 17 September 2014. ^ Bill Lamb. "US Pop Music Charts May 26, 2011". About. Retrieved 17 September 2014. ^ "Michael Grimm - Chart history - Billboard". Billboard.com. Retrieved 17 September 2014. ^ Ng, Philiana (2011-08-25). "'America's Got Talent' Snags Nicki Minaj, Tony Bennett and Susan Boyle". The Hollywood Reporter. ^ "Michael Grimm | Michael Grimm Live". CD Baby. Retrieved 2011-05-21. ^ "Michael Grimm | I Am Michael Grimm". CD Baby. Archived from the original on 2010-10-09. Retrieved 2010-09-16. ^ "Michael Grimm | Leave Your Hat On". CD Baby. Retrieved 2010-09-16. 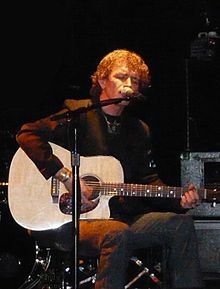 ^ "Tbd: Michael Grimm: Music". Amazon.com. 2009-09-09. Retrieved 2011-03-14. ^ "Adele Notches Ninth Week At #1 On Billboard - MTV". MTV News. Retrieved 17 September 2014. This page was last edited on 3 February 2019, at 09:33 (UTC).